An Example of COUNTIF formula: COUNTIF(A1:D5, ">250"): how you will read this? Simple: Count the value if it is greater than 250 in the cell range A1 to D5. Observe the following image. We have applied this formula: (COUNTIF(A1: D5, ">250") ) in cell E7 and E7 displays the total numbers that are greater than 250 in the cell range A1 to D5. 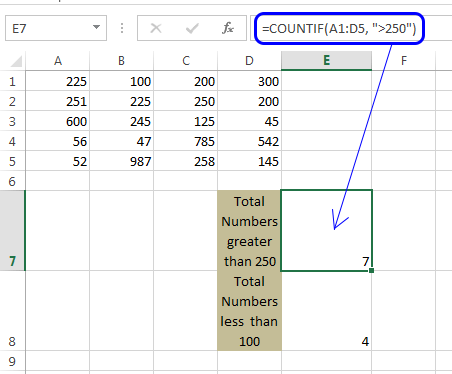 COUNTIF(A1: D5, ">250") formula we are applying in Cell E7. Click here to know about more about COUNTIF formula. Click B1 cell to select it. Write this formula in this cell: “=COUNTIF (A:A, A1)”. 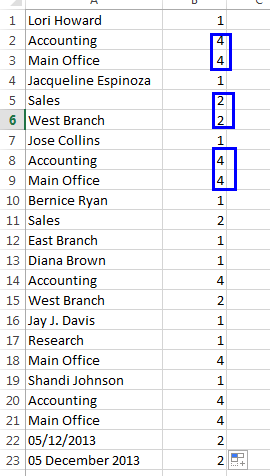 A:A means the column A and criteria A1 means: the value of cell A1. 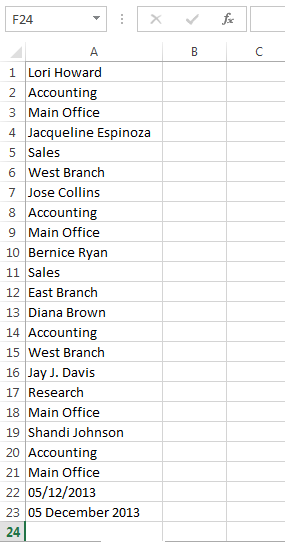 In one sentence the whole command is: Count in the value if the value is equal to A1 in column A. We shall now copy this formula (“=COUNTIF (A:A, A1)”) into cell B2 to B23 using relative cell references. To do this, select cell B1. A square box will be shown in the bottom-right corner of cell B1, it is called Fill Handle. Click Fill Handle, hold it and grab until you reach cell B23.